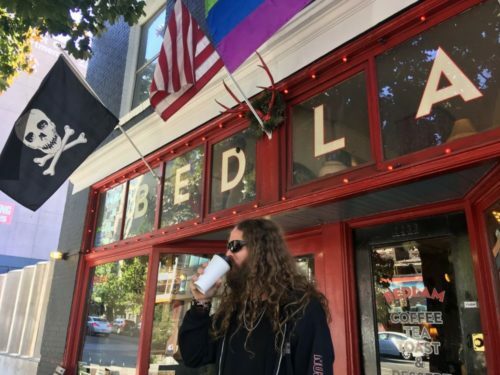 Right wing blogs are enraged that a gay coffee shop owner kicked out a group of anti-choice religious nutjobs. The group was handing out pamphlets in Seattle that called abortion sinful and showed an image of bloody hands and rainbows. They took a break at Bedlam Coffee and went to the upstairs seating area. A heated discussion ensued that was recorded and posted on Facebook by the anti-choice group Abolish Human Abortion. Borgman is agitated, telling the activists to “shut up” and leave. She then made an asinine comment about “safe spaces” and told him that she would be praying for him, presumably to turn him straight. Over the last few years, conservatives have become obsessed with the idea that Christian business-owners should be allowed to deny service to gay people, with one conservative couple even getting into the wedding-filming business for the express purpose of suing the state for the right to deny service to gay people. Right-wingers, though, get in a tizzy the moment people they identify with get denied coffee in a city that has a dozen coffee shops on each street. Some conservatives have made the connection between this video and their work to legalize using “deeply held personal beliefs” as an excuse to discriminate, chortling about how liberals aren’t really so tolerant after all, yuk yuk. The difference is that the video makes it pretty clear that Borgman is not kicking these people out because they’re white, Christian, straight, cisgender, or any other identity. He’s kicking them out because of what they were doing – handing out misogynist pamphlets. And that’s just not the same thing.